In late May, this column highlighted how far the industry has progressed in terms of USDA Quality Grades over time. That trend possesses an important outcome for boxed beef sales – and ultimately influences the amount of revenue coming into the industry, not to mention customer loyalty and satisfaction. At the time, I noted that several key milestones were achieved in May in terms of the upper end of the boxed beef market: the aggregate of Prime and Branded sales represented approximately 26% of all boxed beef revenue—a new record, and May witnessed Prime and Branded weekly sales totaling nearly $160 million in mid-month—also a new record. All that brings us to this week’s discussion. 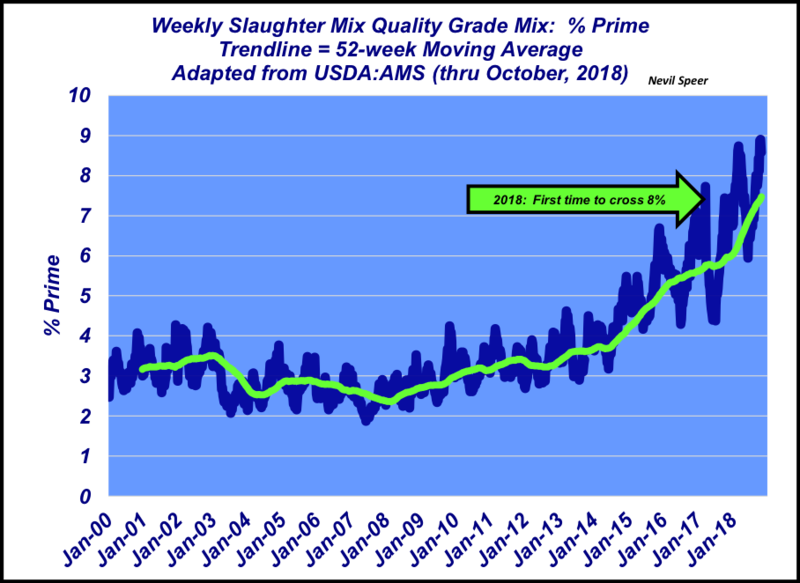 Most notably, the grading trend of the slaughter mix. In May, the column’s tagline read: “At one time, Prime carcasses were merely a happy accident. Then beef producers caught on.” Indeed they have and cattle that grade Prime are no longer an accident. This week’s graph highlights the proportion of cattle grading Prime on a weekly basis since 2000. That percentage didn’t cross the 8% threshold until February 2018. Now we’re into November and the industry is fast encroaching on 9% of the population achieving Prime—an all-time high. That’s no fluke, though. That’s the result of a long-running upward trend. The 52-week moving average is now 7.5% - versus just four years ago when it was only 4%. As noted back in May, the momentum seems to be gaining speed. The trend has clear implications in terms of meeting customer demand for higher quality beef. How do you perceive this trend, and its meaning, in the marketplace? What changes have you made, and/or are making, to adapt to the changing beef market environment? Leave your thoughts in the comments section below.